Provide comfort for the family of Jim Kirchoff with a meaningful gesture of sympathy. 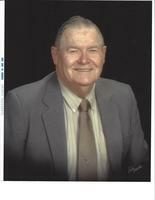 Garden City- Jim L. Kirchoff, 89, died on Wednesday, April 3, 2019 at Garden Valley Retirement Village in Garden City. He was born on October 12, 1929 at Chanute the son of Louis Franklin & Maude Marie (Chance) Kirchoff. He married Joan Demoret on September 24, 1954 at Jetmore. They shared their lives together for 64 years. Jim attended schools in Mullinville and Bushton. He served in the U.S. Army during the Korean Conflict in the Army Corp of Engineers at Fort Bragg. After his discharge he moved to Jetmore and worked for Northern Natural Gas. In 1960 they moved to Garden City where he was a welder for Henkle Drilling and Butler Industries, which later became Oswalt Manufacturing. Jim was a member of First United Methodist Church of Garden City and formerly belonged to Harry H. Renick American Legion Post # 9 and the Eagles Lodge. He enjoyed racing with his son and grandson, KU Football and Basketball, trips with his wife on their Harley Davidson, drawing and building things out of metal. He was preceded in death by his Parents, Brother- Robert Kirchoff and Grandson- Aaron Kirchoff. He is survived by his Wife- Joan Kirchoff, 3 Sons- John & Barbara Kirchoff of Hermitage, Tennessee, Jack & Sandra Kirchoff and Jerry & Julie Kirchoff both of Garden City, Daughter- Linda Jo & Lyle Befort of Sublette, Brother- Donald Kirchoff of Hutchinson, 9 Grandchildren and 8 Great-Grandchildren. To plant a memorial tree in honor of Jim L. Kirchoff, please visit our Heartfelt Sympathies Store. We were so sorry to hear about Jim,we just heard,our prayers are with you Joan. The righteous man walks in his integrity; His children are blessed after him.” ~Proverbs 20:7 We get to witness this truth daily, working with the Kirchoff family. May The peace of God rest on you all.--- Burtis Motors family. I love you Grandpa. Its hard to believe your no longer here. No more smiles, laughs and giggles. No more talking about KU sports, or racing, or just life in general. I am thankful for the time I got to spend with you and all that you did for me. I am thankful you are no longer in pain, but I wish I could talk to you one more time. I love you! We will meet again someday.